Hong Kong’s retail sales value rose 7.1% YoY to $48.1 million in January, higher than market expectations, according to a report by Knight Frank. Three locally related retail categories, comprising of department stores, food and beverage (F&B) outlets and others registered double-digit growth at 15.1%, 13% and 11.8%, respectively. The growth was attributed largely to the festive atmosphere of the Chinese New Year. 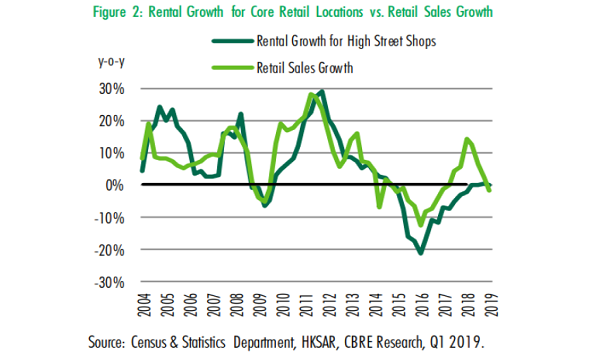 Seasonal variation aside, Hong Kong’s retail market was said to have entered a “new normal”, a condition characterised by a solid sales performance, but at a lower growth rate, the Knight Frank noted. “Unlike in earlier years when the sustained spending of Mainland visitors fuelled growth, now purchases by Mainland visitors have stabilised. Retailers have turned cautious about further expansion,” they observed. Knight Frank also saw more shopping mall landlords willing to lease space to entertainment tenants to diversify their retail mix. Retail landlords are also active in seeking tenants who embrace unique retail concepts, as retailers that provide bespoke products and services are rapidly gaining popularity amongst the increasingly sophisticated consumers. Tai Kwun, a multi-faceted cultural landmark in Central, for instance, has successfully curated a rich portfolio of passionate and creative retail and F&B tenants. It provides a platform for retailers who want to enhance their brands by associating them with art, culture and history. There will be an expected surge in shopping mall supply in 2019, with at least four shopping malls – New World's K11 MUSEA, Sun Hung Kai’s V Walk, Chinachem’s Nina Mall and Swire Properties’ Citygate Outlets Extensions – scheduled for completion, and adding over 2 million sqft of retail space to the market. 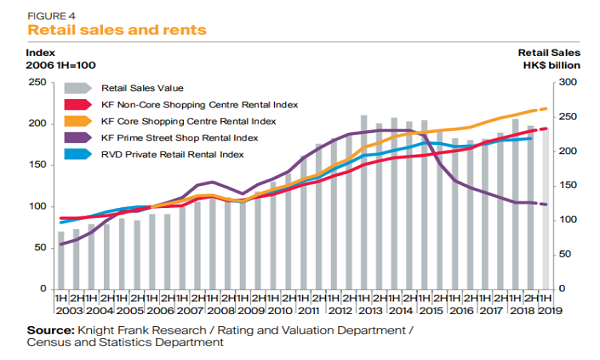 “In spite of the keen competition, we expect shopping centres, especially those with better positioning, to stand out from the rest and to see modest growth in rents this year,” Knight Frank highlighted.